Hafren Forest at Hafren Forest (NRW)0300 065 3000work Forest or WoodlandHafren Forest sits on the edge of the Cambrian Mountains, 7 miles west of the market town of Llanidloes. There are plenty of waterfalls along the river’s way through the forest. Hafren Forest covers 15 square miles and was planted in 1937 - it's a peaceful spot today but before the trees were planted, it was home to lead and tin mining industries. Walk to the source of the River Severn - or choose from numerous walks including waterfalls. Blaenhafren Falls is the first waterfall on the mighty River Severn as it starts its long journey to the sea. The 7 mile long Source of the Severn Trail leads through the forest to the Severn’s source on Pumlunom, the highest mountain in Mid Wales. The footpath goes up the side of Blaenhafren Falls to the falls. There are several shorter waymarked trails from the car park. The 3 mile Blaenhafren Falls Trail is a scenic route through the forest and past the foot of the falls. A shorter walking trail goes through a meadow and crosses a foot bridge where the River Severn thunders down a gully into the famous Severn Break its Neck waterfall. There is also an all-ability trail with a boardwalk along the riverbank to a viewing area overlooking the Cascade Falls. 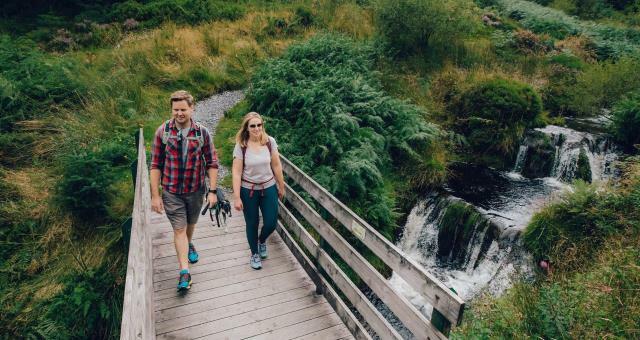 For long-distance walkers Hafren Forest is the start (or end) point for two long distance, linear walks - The Wye Valley Walk and The Severn Way and small sections of the Glyndwr's Way National Trail pass through the eastern edge of the forest. For cyclists, the Sustrans Cycle Route 8 between Cardiff and Holyhead passes through Hafren Forest. In Llanidloes town centre, face the Market Hall from Great Oak Street and take Short Bridge Street directly opposite. Follow the narrow road to Old Hall and then on to the Rhyd-y-benwch car park. The Rhyd-y-benwch car park can also be reached from the northern end of Llyn Clywedog on minor roads. Hafren Forest sits on the edge of the Cambrian Mountains, 7 miles west of the market town of Llanidloes. There are plenty of waterfalls along the river’s way through the forest. Hafren Forest covers 15 square miles and was planted in 1937 - it's a peaceful spot today but before the trees were planted, it was home to lead and tin mining industries. There is open access for horse riders throughout Hafren Forest. Please note: Sometimes we need to close or divert trails for your safety whilst we undertake maintenance work or forest operations. Occasionally we may have to close a site in extreme weather, such as high winds or snow and ice due to the risk of injury to visitors or staff. Please always follow any instructions onsite and make sure you follow any temporary diversion signs in place. From Llanidloes town centre face the Market Hall from Great Oak Street and take Short Bridge Street directly opposite. Follow the narrow road to Old Hall. The Rhydybenwch picnic site is 6 miles west of Llanidloes. It can also be reached from the northern end of Llyn Clywedog on minor roads.